On his 1st leg of 5 day visit, Prime Minister Narendra Modi arrived in Rwanda. With this he became 1st Indian Prime Minister to visit the east African country. 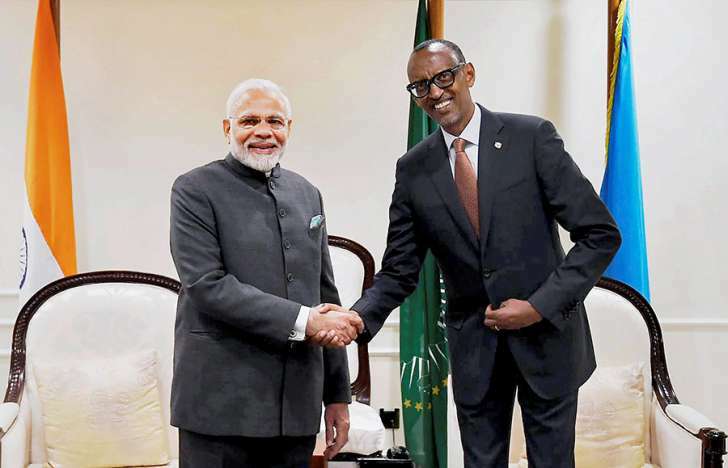 During his two-day state visit, Modi will meet business leaders and the Indian communities in Rwandan capital Kigali. He will also gift 200 cows as a contribution from India to Rwanda's 'Girinka' (one cow per family) scheme. For the first time, Cuba has started providing internet on the mobile phones of select users as it aims to roll out the service nationwide by year-end. Journalists at state-run news outlets were among the first this year to get mobile internet. President Miguel Díaz-Canel has said the move will boost the economy and help Cubans defend their revolution. Chinese Vice Foreign Minister Kong Xuanyou is on a three-day visit to Bhutan. Kong has met Bhutan’s King Jigme Khesar Namgyel Wangchuck and Prime Minister Tshering Tobgay. Note : Bhutan and China have unresolved border issues, and the two countries are in negotiations to resolve the dispute. After his visit to Hathras (UP) today, Yogi Adityanath became the 1st Uttar Pradesh CM to visit all the 75 districts in the state in 16 months of his government's rule. The Lok Sabha passed the National Council for Teacher Education (Amendment) Bill to grant retrospective recognition to Central/State institutions that are conducting teacher education courses without NCTE approval. All institutions running teacher education courses, such as B Ed and D.El.Ed have to obtain recognition from the NCTE under section 14 of the NCTE Act. Note : The NCTE Act, 1993, came into force in 1995 and applies to all parts of India, except the State of Jammu and Kashmir. Trinity supercomputer, hosted at the Los Alamos National Lab, US, has made a world record of creating 1 trillion files in two minutes. The files represent an individual particle's trajectory, velocity, temperature, and spin among other data points. The Odisha Government has unveiled 1st-ever ‘Tribal Atlas of Odisha’. This is a compilation of demographic and cultural information of the tribal population in the state. The Centre today announced a 4-member committee to suggest laws against lynching and mob violence. This comes after the Supreme Court asked the Parliament to come up with a law on lynchings. India has extended ₹1,378 crore ($200 million) Lines of Credit (LOCs) to Rwanda after PM Narendra Modi held talks with the nation's President Paul Kagame. The two countries signed agreements on industrial and agricultural development. Inflation in Venezuela could top 1,000,000% by the end of the year as the country faces its worst economic crisis, the International Monetary Fund has announced today. Comparing the crisis to that of Germany in 1923 or Zimbabwe in the late 2000s, the IMF said, "The collapse in economic activity...will lead to intensifying spillover effects on neighbouring countries." Iran has overtaken Saudi Arabia to become the 2nd largest oil supplier to Indian state-owned firms during the June quarter. Note : Iraq is the largest oil supplier to India. This bill provides for allowing a court trying an offence related to cheque bouncing to direct the drawer to pay interim compensation to the complainant. The Union Government has reduced minimum yearly deposit required under popular girl child savings scheme, Sukanya Samriddhi Yojana to Rs 250 from Rs 1,000 earlier. This has been lowered to enable more people to enjoy benefits of this scheme. In this regard, Government has amended Sukanya Samriddhi Account Rules, 2016. Banks and financial institutions, including State Bank of India (SBI), Punjab National Bank (PNB) and the Life Insurance Corporation of India (LIC) today entered into an overarching Inter-Creditor Agreement (ICA) to fast track resolution of stressed assets of Rs 50 crore or more which are under consortium lending. The ICA is being signed by 22 public sector banks (including India Post Payments Bank), 19 private sector banks and 32 foreign banks. Besides, 12 major financial intermediaries, like LIC, HUDCO, PFC and REC are also signatories to the pact, according to the agreement. NITI Aayog has signed Statement of Intent (SoI) with Lupin Foundation to collaborate in Aspirational Districts Programme to create templates for concerted development policy. Justice Tahira Safdar was today nominated as the 1st woman chief justice of a Pakistani high court. She is going to replace Muhammad Noor Meskanzai who is going to retire on 31st August 2018. British cyclist Chris Froome won his third consecutive and fourth overall Tour de France title in Paeis. The 3540km 23 days long Grand Tour featured a total of 198 riders this year (2018). The Indian contigent at the World Para Athletics Championship ended its campaign with 5 medals (1 Gold, 2 Silver and 2 Bronze medals) in London finishing at 32nd place. In its all India final of US Open, HS Pranoy defeated P Kashyap to lift his 3rd US Open Grand Prix Gold Tournament.